I posted this quesadilla recipe on the site waaaaay back in 2012, so I updated the images and wanted to share it again. It’s a great quesadilla option that I turn to often for part of a filling dinner. Originally, I posted this recipe close to Thanksgiving. My thought was, what could I make for a meal that didn’t result in leftovers (because who doesn’t need extra fridge space during the holidays)? 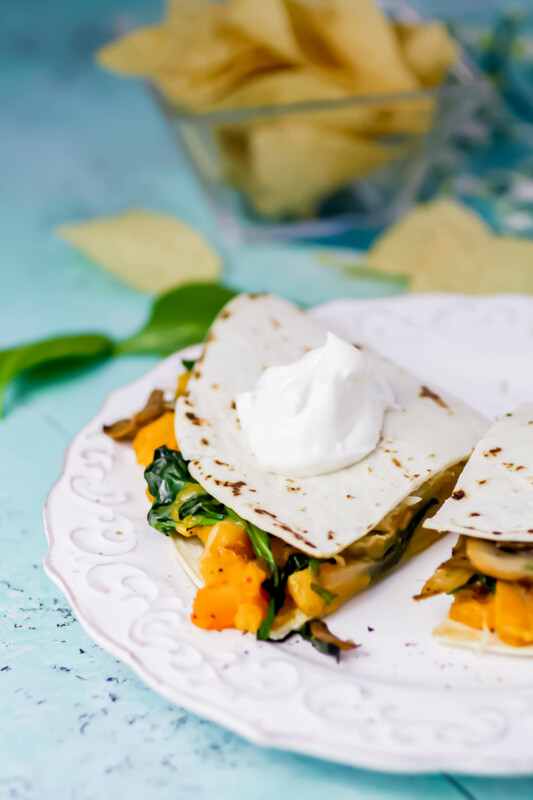 The result was these quesadillas filled with seasonal and colorful veggies. It seems weird to have a recipe for quesadillas, but just in case, this is one to make! And don’t worry, it’s easy to make! Roast the butternut squash (the added flavors from roasting are oh, so good! ), and mash it slightly when it’s finished. I used it as the base ingredient for these sandwich-like goodies. While the squash is roasting, simply cook the onion and mushrooms, then toss in the spinach at the last minute so it’s just slightly wilted. 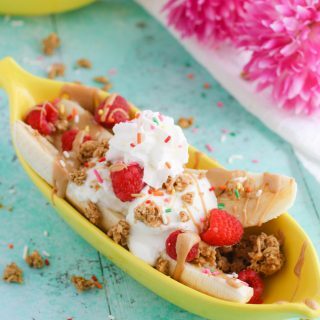 Super easy, and super mouth-watering, amiright? Are you a fan of butternut squash? Then don’t pass up a chance to make Pork Carnitas Tacos with Roasted Butternut Squash! This dish doesn’t take as long to make as you might think, and man does it make delicious tacos! Soup can be comforting this time of year (I’m talking to you Midwesterners and East Coasters — so much snow!) and a great one for you to try is my Easy, Creamy Butternut Squash Soup. It’s nice as part of a holiday meal or simply served on an average Wednesday! 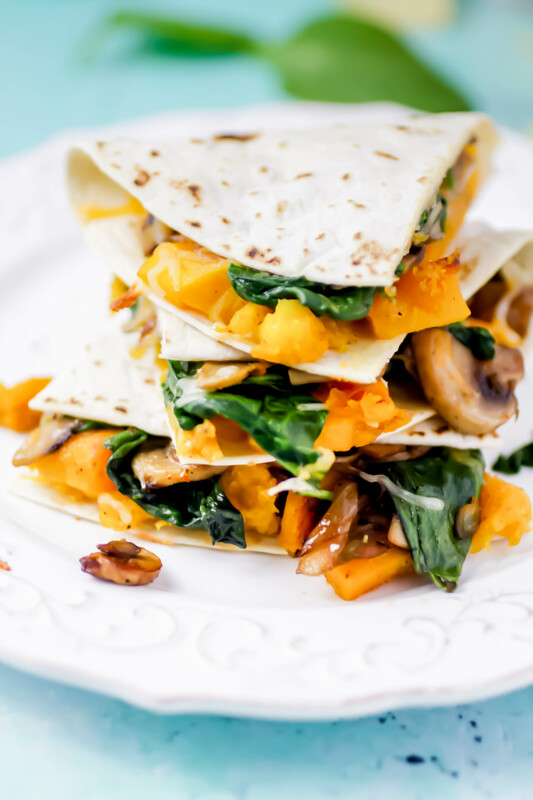 Okay…I really want you to make these Butternut Squash, Mushroom, Onion, and Spinach Quesadillas, but I want to give you one more recipe that includes butternut squash (I swear I’m not a butternut squash spokesperson — at least not officially! ): Butternut Squash Grits with Sausage and Kale is a must-make this season. It’s so comforting and delicious! These quesadillas are so easy to make and hearty for a winter meal. If you’d like, swap in Swiss chard or kale instead of spinach, or peppers instead of mushrooms. I love these as-is, and I’m sure you will, too. 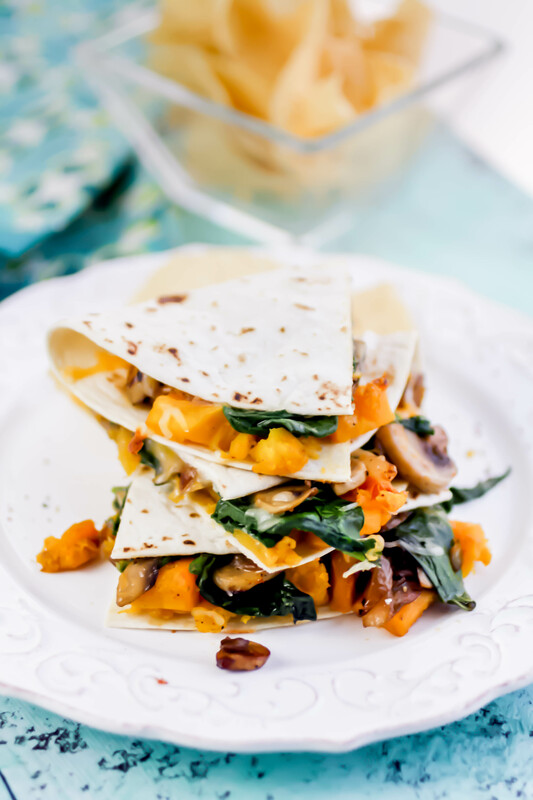 Make a batch of Butternut Squash, Mushroom, Onion, and Spinach Quesadillas and let me know what you think! Preheat the oven to 425 degrees F. Line a baking pan with aluminum foil and set aside. Place the cubed squash in a large bowl and add 1-1/2 tablespoons olive oil, 1/2 teaspoon salt, and 1/4 teaspoon black pepper. Toss to combine. Roast in the oven for about 20 minutes or until it softens. When done, mash slightly with a fork and set aside. Reduce the oven’s temperature to 350 degrees F.
In a sauté pan over medium heat, add 1-1/2 tablespoons olive oil. When hot, add the onion and cook for several minutes, tossing, or until they soften. Add the remaining salt, pepper, and the chile powder and cumin along with the mushrooms. Toss and cook for several minutes until the mushrooms are soft. Turn off the heat and add the spinach and toss a bit until it wilts. Place two tortillas on a baking pan. Spread the mashed butternut squash over half of each tortilla. Divide the mushroom, spinach and onion mixture, and spoon over top of the butternut squash. Top with the Monterrey jack cheese and fold the plain side of the tortilla over the mixture. Bake for about 7-9 minutes. If you’d like, turn the broiler on briefly (about a minute) and allow the tops of the tortillas to brown. Remove from the oven and allow the tortillas to sit for a few minutes before slicing them. Serve warm, with avocado, sour cream and salsa. This is a great recipe to make for an easy, Thanksgiving Eve dinner. Very little prep and like you said no leftovers! Thanks! It's a new fall fave (and it's so easy)! Thanks Shannon! I hope you make and enjoy this! This sounds really good. I love butternut squash but I have my own garden and have had really bad luck growing spinach. I have both chard and kale and will probably use one of those, maybe kale the first time. This is something my girlfriend would love. I usually cook mine on a griddle, folding it over and then flipping it to brown the other side. In the summer I will do almost anything to not use my oven. Thanks for the recipe. I'm sure kale or chard would also be great with this. I love them both! Hope you try this and enjoy! 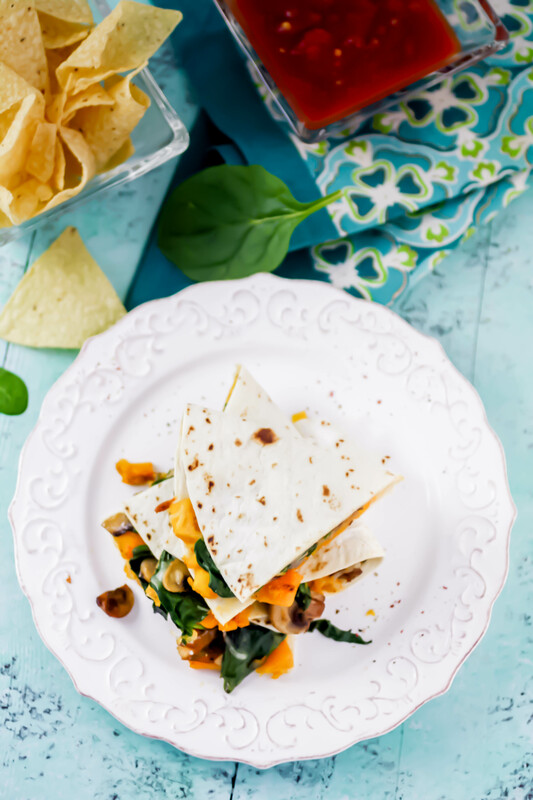 What a good idea to make quesadillas into a healthy, complete meal! Thanks, Catherine! Love all those yummy veggies! These look and sound so amazing!! Ohhhh my goodness, I love all of these ingredients so much and quesadillas are my favorite!! 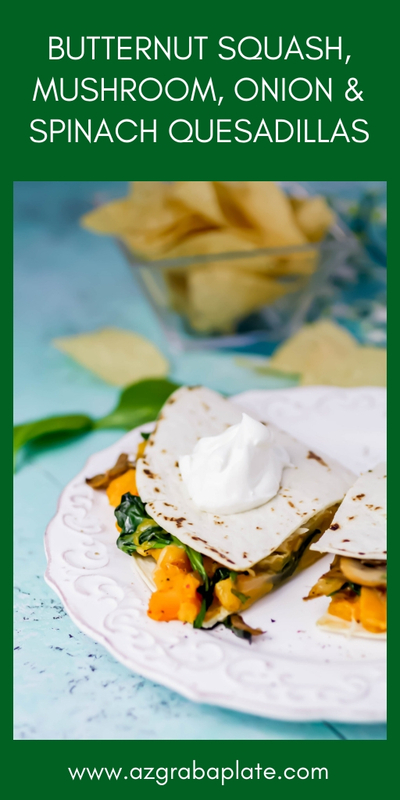 I used to always get chicken quesadillas but I've been loving veggies more and more so this recipe is literally PERFECT for me. Pinning it and trying it ASAP! That's awesome to hear, Katherine! There is so much you can do with quesadillas, right?! I love the veggies, too! Cheers! 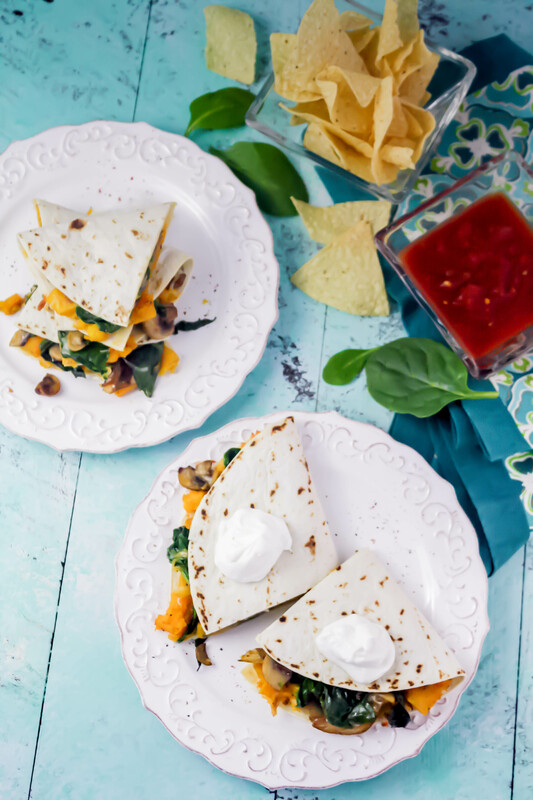 My kiddos love quesadillas and I am always trying to think of new fillings. Loves your recipe! Thanks so much, Nicole! So nice of you to say! I hope you try these and everyone loves them! Looks delicious, saving your recipe my family would love it. Thanks a bunch, Cynthia! I hope you all love it! Cheers!